“Could you please advise of a non-touristy flamenco show in Madrid?”, “I would like to experience authentic flamenco, not flamenco for tourists” and so on and so forth. I get a surprising number of these requests from my blog readers, and I think that it’s high time I addressed this controversial issue. So here I go. Are flamenco shows just for tourists? First of all, what exactly is “touristy flamenco”? I guess it’s synonymous with second-rate and inauthentic flamenco. A touristy flamenco show would be one in which the performers aren’t up to scratch —either because they’re just starting out, or because they’ll never get “there”—, the most folkloric elements of flamenco are highlighted —e.g. there is an extreme abundance of colour or over-the-top drama in the gestures— and there is an overall lack of attention to detail in terms of service, seating and visibility, sound quality, lighting, etc. In other words, it’s a flamenco show that’s stagey and purely exists for cynical and commercial purposes, being to fleece tourists of their money and give them what they think flamenco is (rather than what it actually is). The notion of “touristy flamenco” assumes that somewhere in the city, around the corner, there is “real flamenco” going on, staged just for the locals and true flamenco insiders. Let’s get one thing straight, tourists going to flamenco shows isn’t something new. Flamenco tablaos (i.e. 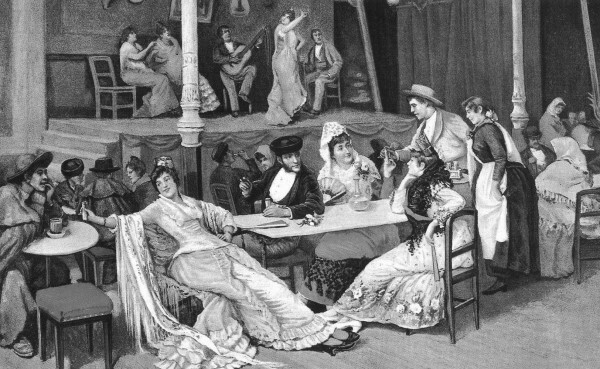 places where flamenco is performed on stage) flourished in Spain in the 1950’s as a revival of the cafés cantantes from the 19th century. 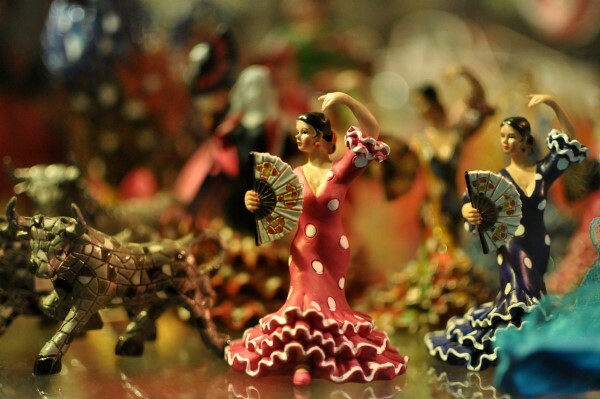 They were designed with tourism in mind, and as a way to offer flamenco to smaller audiences and in more intimate spaces than the big theatres where flamenco had been represented in previous decades. 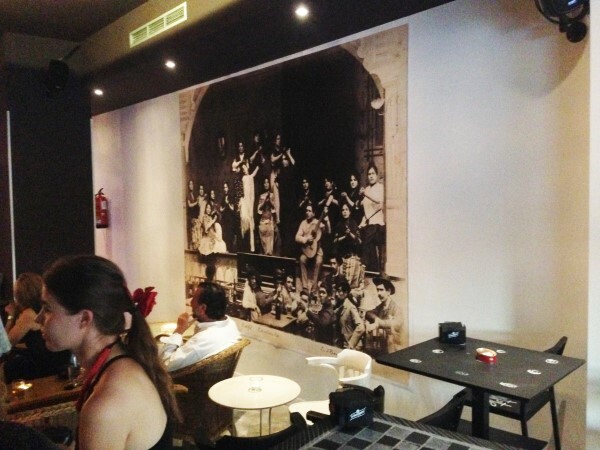 For years, many were set up purely for tourists and current flamenco shows come out of this tradition. But happily nowadays the times are a-changing. Flamenco tablaos are enjoying a rennaissance, and lots of high-quality flamenco is being performed in venues throughout Spain every day, many of which, lucky me (maybe lucky you, too), are in Madrid and are listed in my up-to-date flamenco calendar. The artists that perform in these shows are professionals that make a living out of flamenco and are committed to the art form. Also, many venues are investing in their premises, so as to offer the best experience possible. My friends at Flamenco Real know a great deal about this. They have developed a unique, exhaustive system to audit flamenco venues and help tablao owners offer an amazing and authentic experience. Besides their daily shows with flamenco singing, dancing, guitar and percussion, some flamenco tablaos are running incredible flamenco programs with a focus on flamenco singing and/or guitar. These shows are usually cheaper, too. A few key flamenco recitals held in Madrid are those at Sala García Lorca (upstairs from Casa Patas), the Círculo Flamenco de Madrid‘s recitals at Las Tablas, and the recitals at Café Ziryab. Beware though: in most of these performances there is no dancing (to be an authentic flamenco performance, the show doesn’t have to include dance and this allows singers and guitarists to come to the fore). If you go to a flamenco tablao, chances are that there will be tourists around you, unless you go to a flamenco recital, where you are more likely to be surrounded by local flamenco fans. The economic reality in Spain means that flamenco does need tourists who appreciate this art form to go to the tablaos, to support the industry and make it possible for flamenco artists to live on their artistic skills. The upshot? Flamenco shows that tourists attend is totally compatible with high-quality flamenco. So fear not, go ahead, book your tickets and enjoy. And if you’d like me to select a show for you, and give you a private, guided flamenco experience (explaining the origins, culture and music as well as accompanying you to the show), then check out my private flamenco tours. Olé! See you in Madrid!